Strange. My guild has gotten 10 of these in about 6 months. Maybe the drop rate was increased slightly. Unyielding owns about 3 of these and have killed him MANY times... This is rare as hell. Incidentially 2 druids own them. 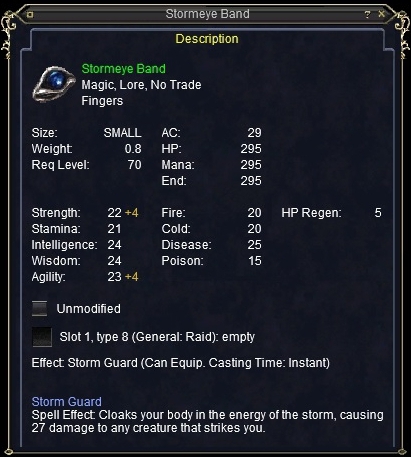 Aside from the AC and the resists, the avoidance, the regen, the HP, the Mana, and the fact that this has both more intellegence and wisdom than either strength or stamina, you're right Minzac, this is a pretty horrible caster ring. In that order. Personally, I see nothing wrong with a druid having that ring. If a melee wanted it worse, it is their job to have the dkp to win it first. Oh, btw, it's uber, not ubber.